Take it from a former retail employee: If you're spending money today, it's the stores who are getting a good deal. 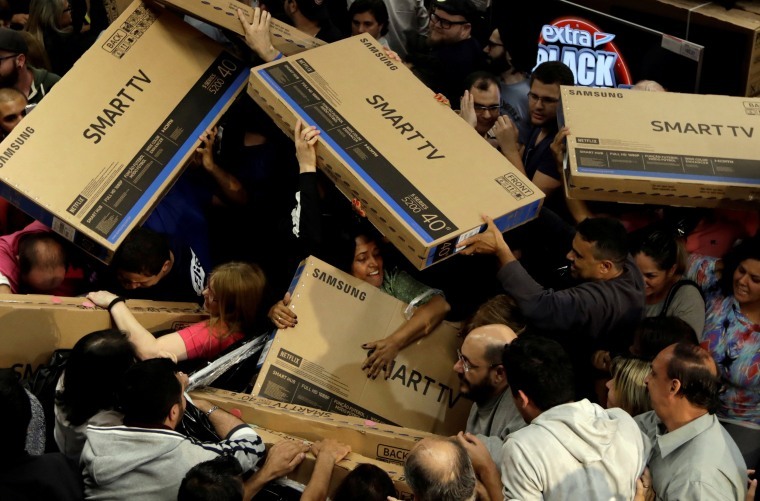 Black Friday is upon us, the day on which millions of American consumers jam themselves into every mall and retail establishment to do battle over DVD players, flat-screen TVs and other “doorbuster” items meant to draw in shoppers for what is one of the busiest shopping days of the year. Not everyone looks forward to black Friday, especially the people who work in those retail stores who will be there well before 6 a.m. — or at 6 p.m. on Thanksgiving Day — to unlock the doors and let the hordes of bargain-hungry shoppers in. Having been one of those retail drones only a few years ago, I have a couple of secrets to impart to you. If you’re like me and millions of other Americans this year, you’re having to pinch pennies and watch your spending this Christmas. While the economy may be roaring for millionaires, many of those benefits are not exactly trickling down. The Census Bureau estimates that over 40 million Americans are living in poverty, while many more are underemployed. Thanksgiving is a time for overindulgence and feeling guilty. Break the cycle. “Two-thirds of American households, by this measure, are desperately scrambling to make ends meet from check to check. Nearly half the American population earns too little to live on comfortably,” wrote Peter Georgescu earlier this year. So, despite what the commercials suggest, most of us will not be surprising our spouses and partners with brand new his-and-hers SUVs. In fact, many of us would be lucky to be able to afford both a left and a right roller skate. But if you’re one of the working (or non-working poor) hoping to score a bargain on this great holy day of conspicuous consumption, this is where I impart to you the great secret of the day. By all means, you should participate in the festive rush of Black Friday — but you should consider it a reconnaissance mission for things you will actually buy later, that is, if you choose to buy anything at all. For many years I worked in retail selling books at the now-defunct Borders Books and clothes at Old Navy (as well as a dozen other jobs hardly worth mentioning) and without fail, every company has its items at their highest prices of the year on Black Friday. Yes, there are so-called “doorbuster” specials to lure you in, loss-leader items that have usually vanished long before 9 a.m. on that humming, buzzing day of consumer activity. Beyond that, everything in the store is at full price and retailers are literally banking on your inability to resist the buying frenzy around you. Black Friday, after all, got its name from the fact that companies typically generate enough earnings in a single day to make up for losses from the rest of the year, putting them “in the black.” So it’s not really about you getting deals as much as retailers getting profits. By all means, go to Black Friday and enjoy the noise and spectacle of it, but leave your credit and debit cards at home and turn off your Apple Pay on your iPhone. This Friday is a day to strategize about which things you’re going to buy when the prices drop two weeks before Christmas Day — and they will drop, guaranteed. And while strategizing about what to buy is a time-honored tradition in some families, others seemingly find the idea that one might shop but not buy positively confusing. Ignore those people. Shopping can be its own delicious indulgence, moreso than buying. Recently — and in spite of the fact that my checking account was overdrawn — I got a yen to shop for some jeans. Men’s jeans have become even more complicated to buy as cuts for different body types have become more common and men are forced to asking themselves Am I skinny or slim fit? Relaxed? Do I need stretch or 100 percent cotton? In spite of the fact that I knew I wasn’t going to buy anything, I took a leisurely few hours going from store to store and trying on different brands, cuts and blends of cotton. Plus, although I was shopping right in the dead zone between the end of summer stock and the arrival of the first wave of fall merchandise, selections weren’t great, but I got an idea of exactly what I wanted. Retailers are also using a million mini giveaways and promotions to get you to buy their products at this time of year. Take advantage of as many of them as you can for free. Why are so many holiday foods so gross? Of if you can’t afford that bottle of Terre d’Hermès eau de parfum for your beau, go to a few different stores and get him five or six samples; it smells just as good and the little vials are easier to travel with. Go forth peacefully among the shiny, tempting things. Treat yourself to the nectars and ambrosias on offer for free, but know in your heart that, as surely as night follows day, after Black Friday comes Markdown Tuesday. On that day an army of sales associates with price tag guns in their hands will fan out and start reducing prices on everything except a few choice items. This is when you will make your move, smart shopper. The laws of retail gravity are going to drag those prices lower and lower right up until the actual busiest shopping day of the year: The Saturday before Christmas. In the meantime, enjoy shopping, not just buying! You can have a lot of fun without ever spending a dime.